The killer calf workout on this page uses 3 of the best calf muscle building exercises. If you want to build bigger calf muscles try this calf workout routine. It just uses 3 exercises that are guaranteed to pump up your calves. You can click on the picture to learn more about the exercise. 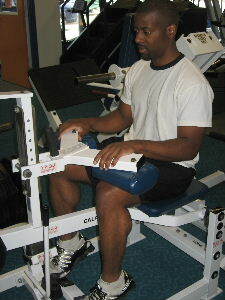 The first exercise is seated calf raises. The seated calf raise places a little more emphasis on the soleus and accessory calf muscles. Do 2-3 sets of 15-25 repetitions. Rest 45-90 seconds between sets, and then move on to the next exercise. 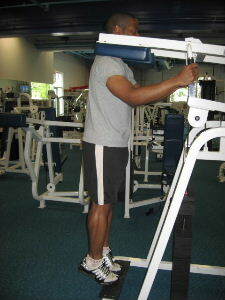 The second exercise is the standing calf raise on a machine. Do 2-3 sets of 15-25 repetitions. Rest 45-90 seconds between sets, and then move on to the final exercise. 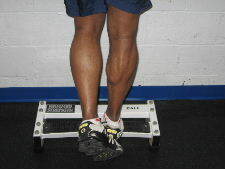 The third exercise in the workout is one legged calf raises on a step. This is a body weight exercise so there is no need to add any weights. Your calves should be pretty fatigued at this point, and the 1 leg calf raises are just a finishing movement. Do 2-3 sets of 15-25 repetitions on each leg. Rest 45-90 seconds between sets. Make sure that you go slow during each exercise and pause at the top and really squeeze your calf muscles. If you haven't been working your calves recently, start with just 2 sets per exercise and build up to 3. Also, make sure your use the foam roller and stretch your calves after the workout. Be prepared to be sore the next day, and remember to listen to your body.